Ski Magazine's review of the Dynastar Contact 11 (All Mountain Expert - Speed) gives this ski a very good review, high marks for short turns, long turns, and forgiveness, and said "It rips in bumps, where it outperformed everything else in the category."? The RealSkiers.com review is good, too, and it's one of the Dynastar 1SQ skis for Pros and Experts, but it doesn't show the mogul symbol, or mention moguls, pro or con.? 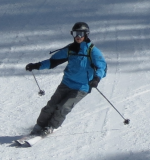 My guess is the ski is great in bumps for the pros who test for Ski Mag, but too stiff and unforgiving for the typical recreational skier, even good ones.? I'm planning to demo it, regardless.? Has anyone tried it?? ? Personally I would ignore bascically everything you read in the ski magazines about gear. They are tests paid for by the ski gear companies who continue to be the advertisers that keep ski mags in business. Peter's reveiws are objective. Does anyone know if the Contact 11 has layers of metal in it. Perhaps Peter doesn't rate skis containing layers of metal for moguls just because of the possibility of bending the ski if you jam it into a mogul? When I first read the Dynastar reviews, I didn't even know they made a 10 and 11 Contact. I can only think that maybe the manufacturer didn't supply those skis for testing. Not sure if they change the numbers due to stiffness but I think that the dimensions vary between the three skis potentially creating a different turn radius. As the season goes on, it would be interesting to hear from people that test them and what they think. From the look at Peters review, the Contact 9 looks like a great ski. SierraJim over at epic uses the Contact 11 as his everyday ski. Jim owns/manages the largest ski shop in California. I'm very curious about this model, too.